Mix 1/4 cup olive oil with ¼ cup of balsamic vinegar, salt, pepper, juice of 2 limes and ¼ cup honey. Whisk together in bowl until blended and set aside. Marinate Tri-Tip Roast in ½ cup olive oil, 1 TSP garlic powder, 1 TSP onion powder, 1 TSP dried Rosemary, juice of one lemon, salt and pepper. Coat evenly and marinate for ½ hour in refrigerator. Bake Tri-Tip Roast at 425 degrees for 40 minutes. 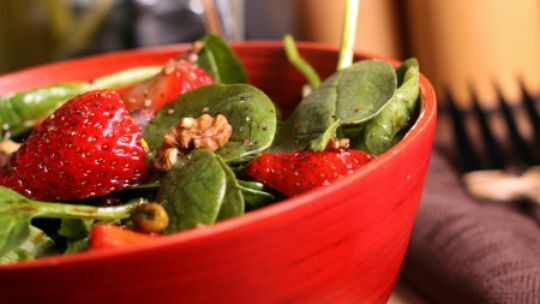 Assemble spinach and lime vinaigrette in mixing bowl with tongs until evenly coated and top with feta, berries, nuts and sliced steak.